This review is of the Mom & Toddler Box, $27.99 a month. LIMITED TIME DEAL: Today only, get $10 off Ecocentric Mom Mystery Boxes (regularly $44.99), no coupon code needed! Now through 11/27, use coupon code BFGIFT to get a free bonus gift and save 15% off a gift subscription! My box didn’t have a postcard this month, but the theme was “A Holiday Feast” in preparation for Thanksgiving. The first item I pulled out is one that is SUPER boring, but something I’ve been meaning to buy for a long time: reusable produce bags for the grocery store! I’ve been using reusable shopping bags since before it was cool, but for some reason has never picked up a set of these. Four of these bags are what I’d say are “bunch of kale” sized (11″ x 14″) and the smallest is perfect for storing the other four or picking up smaller items like garlic or a few hot peppers. These are simple mesh bags with a drawstring – nothing too fancy. You want these to be lightweight so you don’t end up paying extra for your bags when you put your veggies on the scale at checkout, and these definitely fit the bill! I like that the cords are different colors, too. I’m so happy to add these to our arsenal and get to work reducing our household waste in one other small way! Snacks are usually his favorite so it’s not a huge surprise that these were a big hit! Each bar has a soft oatmeal texture, easy to bite without making a big mess. He definitely preferred the Apple Cinnamon (it was gone in less than a minute). We ended up sharing the Blueberry Lemon and I really liked it; these are not overly sweet but still have a good fruit flavor. We also got a coupon for Plum Organics, good on any of their products. These snack bars were new to us but we are already fans of their fruit and vegetable puree pouches! This organic hazelnut spread is one I’ve sampled before, but it’s so good, I’ll happily accept it in any box. This was the perfect amount to spread generously on a piece of toast one night as a little treat. This was one of the two items I selected this month. This set of toddler sized stainless steel silverware comes packed in a cute case that reminded me a bit of a sunglasses case! These are dishwasher safe, with melamine handles, which means they should last through multiple kiddos. When I selected this item, I didn’t expect it to be packaged so nicely! This would also have been perfect for gifting. My skin is heading into its winter dry season, so I wasn’t sure if I would really like these wipes. Tea tree oil and salicylic acid sounded like a recipe for super dry skin! I was really pleasantly surprised though. These are somehow gentle on my skin and don’t dry me out too much, although I definitely need to moisturize after. I don’t always have these types of towelettes on hand, but I do buy them when I travel. I like these enough that I’d consider using them instead of my usual go-to Burt’s Bees wipes next time I’m on a trip. This was my second selection for the month. I’m not a big ‘mask’ person, but I was really intrigued by this little mix-it-yourself kit for a “purifying” mask! It comes with two packets of dry mix, each one good for a full face mask. They also include a little ceramic dish and spatula for mixing. African black honey; aloe vera; water; ginseng; Angelica; peony; atractylodes; job’s tears; madhunuhi; hyacinth orchid; caltrop; talc; green tea; European verbena; typhonium rhizome; mung bean; abricotier kernel; Chinese sage; Ampelopsis; Solomon’s seal; cortex dictamni; Chinese gold thread; chrysanthemum; mulberry. The mask is very gooey; it’s obvious that the base is honey. I divided this pot in half in my little mixing dish, then added in one dry packet to create the mask. It did take a fair amount of mixing to get it well distributed, and my final mask was still a bit grainy. I applied with the spatula and waited 15 minutes. This didn’t get totally dry like a clay mask might, but I did feel some tightening. I’m a total skeptic when it comes to most things, skincare products included, so I was surprised that my skin both looked and smelled great after washing this off. I usually have a slight redness in my cheeks, and this noticeably made the redness go away almost completely. The grainy texture was a bit exfoliating, too, and my skin felt very soft all evening and the next day. The websites notes this mask has a shelf life of two months, and mine did have an expiration date marked that was a few weeks after I received the box… but I still had enough time to use the mask twice, once a week, before it expired. My November Ecocentric Mom Mom & Toddler Box (with my customized selections) had an overall value of about $44.29. I particularly loved the mask this month, which provided some much-needed me-time with the holiday season upon us. I usually find the overall value of this box is higher than this month, but I will use and love absolutely everything in here, so it’s a HUGE win for me! Is this box still available if I subscribe today? No. 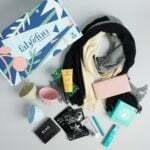 If you sign up now, your first box will be the January box.